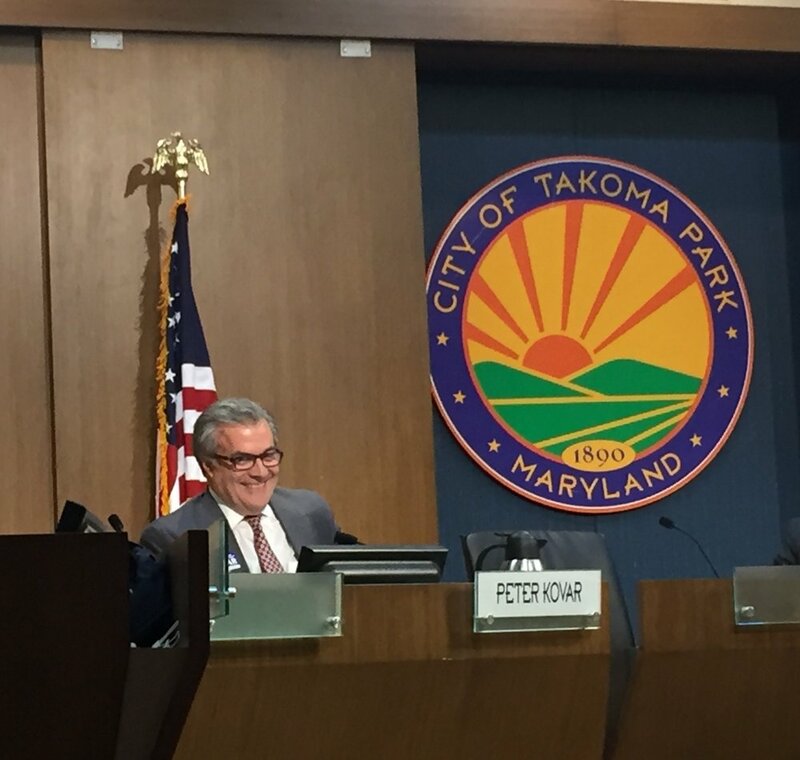 Here’s a link to the agenda for the April 10, 2019 City Council meeting: https://takomaparkmd.gov/meeting_agendas/city-council-meeting-agenda-wednesday-april-10-2019/. The meeting starts at 7:30 PM with a public hearing on the City Manager’s proposed budget. We’ll have votes on four topics: the New Hampshire Avenue Recreation Center land transfer, plus contracts for stormwater evaluation and testing; upgrades to the Community Center auditorium; and the Sustainable Energy Action Plan. There will also be a presentation on the “What’s My Bias?” program, and a brief work session on resident committee appointments. BUDGET INFORMATION: https://documents.takomaparkmd.gov/government/city-council/agendas/2019/council-20190410-1.pdf. The Takoma Park fiscal year runs from July 1 to June 30, and City Manager Suzanne Ludlow last week formally presented her proposed budget for Fiscal Year 2020. Through April and into early May, the Council will be considering the budget, with final votes expected in mid-May. That timetable ensures that our tax and budget decisions can be meshed with the County’s processes in time for the July 1 fiscal year start. There’s more information on the budget available through this page on the City website: https://takomaparkmd.gov/city-blog/presentation-of-the-proposed-budget-fy-2020/. It includes important details on the schedule of public budget events for those who may wish to follow the debate more closely or comment publicly. I’ve also set up two meetings in the Community Center for Ward One residents who’d like to talk with me about the budget. The meetings are Thursday, April 11 from 7:30 - 9:00 PM in the Hydrangea Room and Saturday, April 13 from 1:00 - 3:00 PM in the Lilac Room. If you can’t make either of those meetings or if you would like to meet individually, please contact me so we can arrange a convenient time. I’m pleased that broadly speaking the proposed budget calls for continuing to make progress in key Council priority areas like the housing and economic development strategic plan; affordable housing; community policing; racial equity; grants that benefit underserved populations in the City; stormwater improvements; environmental sustainability; youth recreation programs; translation of City documents and announcements; and our financial reserves policy. I’m also glad that the budget calls for moving forward on the Flower Avenue Green Street and the Library renovation. For the Library, we’ll be heading into the more detailed design phase, with the ability to consider changes to the project depending on the construction bids we eventually get. I’m still reviewing the budget documents, having technical questions answered by staff, analyzing the impact of the proposed tax rate in the context of the recent property assessments, and of course hearing from residents. In upcoming messages, taking into account all of that feedback, I’ll be providing more details of my thoughts on the overall budget, specific programs, personnel levels, the tax rate, etc. Meanwhile, for those who may wish to probe more deeply into the budget you can look at either of the following two links. The first is an excel spreadsheet used by staff as they developed the budget. It will allow you to get a more granular look at City expenditures, program by program. The second is a compilation of key budget and financial documents going back a number of years. Proposed Property Tax Rate. For many residents, the key component of each year’s budget is the municipal property tax rate. This year, with a proposed budget that has few new initiatives and includes some cutbacks in spending, the proposal also calls for an increase in the local tax rate from $0.5291 per $100 of assessed property value to $0.556. For a home assessed at $500,000, if there’s no change in the assessment, that rate change would result in a hike in the tax payment from $2,646 to $2,780, an increase of $134. If a homeowner’s assessment is going up, the increase would be higher. Furthermore, owing to changes in Federal tax laws, which limit the deductibility of state and local taxes, the impact of local taxes may be more pronounced. For these reasons, I intend to do what I can as the Council works on the budget in the coming weeks to explore options for reducing spending in order to soften the impact of the local property tax. While modest reductions around the edges of the budget can have similarly modest impacts on spending, in order to have a more significant effect, it will most likely be necessary to reduce programs or services. An important part of the effort to consider options of that type will take place on Monday, April 15 when the Council will have a special work session devoted specifically to looking into potential reductions in programs and services. I’d certainly be interested in hearing from residents with any thoughts on specific spending areas that could be reduced or increased. If you can’t make it to the hearing this week, you can also speak at the public hearing on April 24. And you can offer your views during the public comment period in any of our regular Wednesday meetings, as well as pass along your thoughts via an email to the City Clerk (jessiec@takomaparkmd.gov). She’ll share it with all Councilmembers. Impact of Tax Rates. In my time on the Council, I’ve been through three budget cycles, and I’m pleased that in each year we were able to reduce the property tax rate. In 2015, it was $0.585 and in the following years we reduced it to $0.5675, $0.5348 and then our current level of $0.5291. For this year, the Constant Yield rate (the property tax rate at which the City would be estimated to take in the same overall amount of revenue next year as this year) is $0.526. This is quite close to our current tax rate, meaning that if there’s no change in the rate we’d have just a little more revenue than in the current year. What do these rates translate into in terms of City spending? One way to think about it is that under our current budget situation one cent is equivalent to about $243,000 in spending. Thus, in order to reduce the proposed tax rate of $0.556 per $100 down to the current level of $0.5291 (a cut in effect of 2.69 cents) the Council would have to approve net spending reductions totaling $654,000. To get down to the Constant Yield rate of $0.526 (an even 3 cent reduction) there would need to be $729,000 in net reductions. It’s not clear at this point to what extent there is support on the Council for making reductions of this sort. But I believe we can make some cuts while still continuing to provide the kinds of programs, services and initiatives that make Takoma Park a great place to live. As noted above, I’ll be exploring options along those lines as we continue working on the budget this month. WHAT’S MY BIAS REPORT: https://documents.takomaparkmd.gov/government/city-council/agendas/2019/council-20190410-2.pdf. A report will be presented by the facilitators who led this series of workshops as part of the City’s racial equity efforts. NEW HAMPSHIRE AVENUE RECREATION CENTER LAND SWAP: https://documents.takomaparkmd.gov/government/city-council/agendas/2019/council-20190410-3.pdf. As a strong supporter of the idea of renovating and improving the Rec Center, I’m pleased that we’ll be taking action on this land exchange, which is a key step in the process of being able to move forward on the redevelopment plans. There are two aspects of this issue on which I’ll be seeking clarification: the County easement that’s referred to in the background material, and the status of the County funding for recreation programs at this site, which is also mentioned. CITY CONTRACTS. I’ll be voting yes on the following three contracts. COMMITTEE ASSIGNMENTS: The specific appointments were not available as of the time I prepared this message. Please feel free to contact me with any questions or comments about the issues that are covered in this blog post.